The Mobile Warming Barra Leather Textile Heated Glove is designed as an extreme-weather heated glove that is great for everything from shoveling snow to riding a motorcycle in freezing temperatures. Featuring our powerful Lithium-Ion powered heating system and Rainguard, our advanced waterproofing technology, this glove is your match. The Barra Glove features premium goatskin leather and rugged Carbolex nylon to offer warmth and protection any rider can appreciate. This great heated glove utilizes slim batteries for a comfortable fit and we have trusted Mobile Warming heating technology for years to bring you powerful warmth and efficient heating. Don't let the thought of cold fingertips keep you from your favorite outdoor activity this winter season. The Mobile Warming Barra Leather Textile Heated glove provides durable weather protection and reliable warmth during the worst stormy days. You won�t miss a beat wearing this high-performance glove constructed of high-quality goatskin leather, rugged Carbolex� reinforcements, and durable molded rubber in the gauntlet and knuckles. The Barra�s interior uses Rainguard� waterproofing combined with our far-infrared heating system to provide exceptional warmth. Powered by a set of ultra-slim rechargeable 7.4-volt Lithium-Ion in-cuff batteries, this glove provides comfortable, long-lasting protection. With a touch-of-a-button, you can select from four different temperature ranges to ensure you find the perfect setting for your ride. The Barra Glove also features Antistatic technology and is touchscreen compatible�keeping you in touch on-the-go. Gloves are of good quality. Really look and feel nice. ConsCuff is too small to fit over the cuff of my jacket. There were no instructions with the gloves at all. I had to call customer service to find out how to turn on the heat. very tight at the cuff area. Also, what do the different color heat settings mean? i.e. red is HIGH, blue is LOW?? etc.... and what about those of us that are colorblind! Make it user friendly for everyone! Other than these items, the glove warms nicely. Consvery tight at the cuff area. Also, what do the different color heat settings mean? i.e. red is HIGH, blue is LOW?? or? etc.... and what about those of us that are colorblind! Make it user friendly for everyone! Other than these items, the glove warms nicely. I bought these gloves as a gift for my husband. The fit sizing is accurate. He used these for the first time shoveling snow even tho I bought them because he like to ride his Harley way earlier and later in the season. He is the one that gave these gloves the 5 stars. They kept his hands AND fingers warm. Worth the money since he is so happy with them. Have struggled for years with poor circulation in my hands ( Raynards Syndrome ), which limited my Bicycle riding in cold weather. 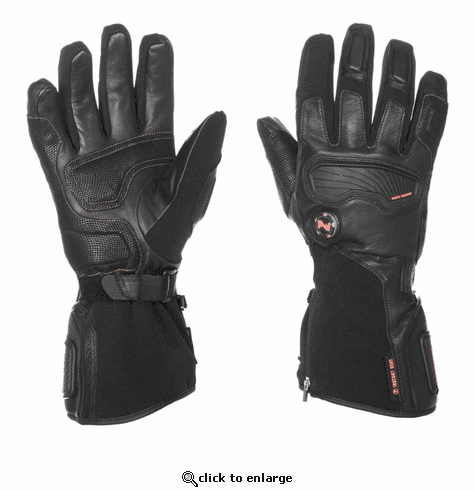 These gloves are easy to use- nice even heat, and not much bulkier than heavy duty bike gloves I have.